In a lecture from 1976, Michel Foucault defined the term subjugated knowledge as “historical contents that have been buried and disguised in a functionalist coherence or systemization.” I have often thought of this term—subjugated knowledge—when thinking of queer history—the various methods of coding and decoding that propel a certain type of work within the artistic canon. An elliptical, strange kind of surfacing. For example, is it fair to consider Oscar Wilde’s Dorian Gray a gay man? What about Sebastian and Charles in Brideshead Revisited? And what to make of Christopher Marlowe’s Edward II? These questions provoke tedious debate—were they or weren’t they?—a debate which often requires a dissatisfying theoretical framework. But then there is an all-together different kind of intellectual pursuit, beyond queer archeology; there is the work of the imagination. Often, where knowledge is subjugated, imagination is invoked to fill in the gaps. This is the purview of the artist, and art is the mechanism through which one attains alternative histories, and consequently perceives alternative futures. We suddenly imagine possibilities where we are told no possibilities ever existed. 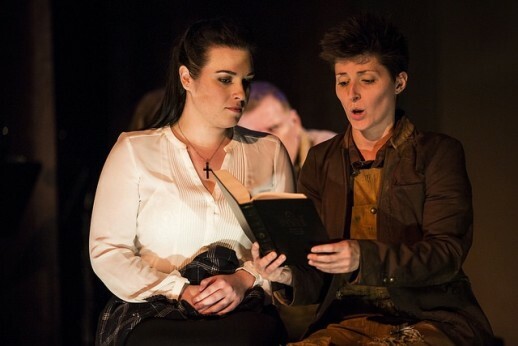 The opera Patience and Sarah is a fantastic example of this radical creativity (another case is the recent, successful debut of Gregory Spears’ opera Fellow Travelers). Based on the 1971 novel of the same name by Isabel Miller (the nom de plume of Alma Routsong), Patience and Sarah tells the story of two lesbians in Connecticut during the early part of the nineteenth-century. While the narrative takes its inspiration from the historical figures of Mary Ann Willson—an obscure painter—and her partner Miss Brundage, the opera riffs on the experiences of historicized queer people, proposing a modern identity politics long before such ideas were widely circulated and defined. The opera, which premiered at the 1998 Lincoln Center Festival, was thankfully revived again Thursday night in a staged concert reading at The Players Theater on Macdougal Street. The lyrical, expressive score by Paula M. Kimper is the opera’s central attraction, and the closest comparison I can make to Kimper’s style is Aaron Copland, who similarly envisioned an America wide open to possibility and authenticity. Kimper, like Copland, makes use of hymn-tunes and a distinctly folk idiom, with slight dissonant bends to bitter her sweetness. The result is a melancholic soundscape, at turns inspiring and mournful. In light of the score’s admirable qualities, it was disappointing to hear it played by such a lean ensemble. I understand the economic and spatial reasons for this decision—but it would have been especially nice to hear the full breadth of Kimper’s music, galvanized by the heft of a traditional orchestra. Instead, the small Paula Kimper Ensemble provided skeletal support. The cast was also uneven. In the title roles of Patience and Sarah, Nadia Petrella and Elsa Quéron were unfairly matched, with Quéron’s spunky charisma overwhelming Petrella’s tepid, unfocused characterization. And while Quéron possessed a metallic, clear mezzo-soprano, Petrella’s voice was unfortunately insecure, lacking clean phrasing and robust color. But then again, perhaps it is easy to identify with the character of Sarah, because she maintains the opera’s focus throughout. Indeed, the narrative really belongs to her, as we follow her journey from a poor Connecticut house to the open road where she goes “pioneering.” There she meets a man who goes by the name of Parson Peel, sung effectively by Michael Kelley; and, in order to avoid suspicion and abuse, she tells him her name is Sam, disguising herself as a boy. Parson Peel is, besides Patience, the only character in the opera that seems to really care for Sarah, though he is unaware of her actual gender and sexuality. Parson Peel offers her food, work, and an opportunity to learn how to read. And it is these scenes within the opera that were the most moving. In these moments, Sarah’s identity and dignity begin to emerge in startling ways. Parson Peel exhorts Sarah: “You have to be yourself… and live your dreams.” And while Sarah starts to make sense of alien letters and words, peering over a book given to her by Parson Peel, she also slowly understands her own desires and aspirations. Sarah’s burgeoning identity and integrity shape the rest of the opera’s trajectory, leading to a conclusion that reinvestigates the idea of “pioneering,” beyond notions of space. For Patience and Sarah, now understanding the implications of their mutual attraction, decide to leave Connecticut for upstate New York in order to start a life together. Wende Persons‘ libretto is particularly admirable in the way that it makes this conclusion seem, by some degree, inevitable. Once Patience and Sarah, liberated from the constraints of their families’ false piety, decide to determine their own trajectory, the narrative’s conclusion becomes unavoidable. However, while this ending was rhetorically successful, it also tended to drag in its execution. I enjoyed much of Patience and Sarah, but I also felt that the ending was a bit long and overly determined. Though Patience and Sarah dominate the opera, the supporting players swirl around them in a cacophonous cloud of disgust and judgment. In particular, Sarah’s father Pa Dowling, sung by Duncan Hartman, was a one-dimensional caricature of patriarchal oppression. As Patience’s more sympathetic brother, Edward White, Chad Kranak was milquetoasty and petulant. The rest of the cast followed suit, never quite figuring out their place within the opera’s dramatic ecology. The one enigmatic anomaly to this was Bryn Holdsworth as Rachel Dowling, Sarah’s sister. Vocally competent and cleverly conceived, Holdworth’s Rachel was a pathetic, confused creation, a strange hybrid of jealousy, determination, and naiveté. In the private journals of Candy Darling, one of Andy Warhol’s famed superstars (a pioneer in her own right), Darling writes: “You must always be yourself, no matter what the price. It is the highest form of morality.” This tenet would fit right at home in the rhetoric of Patience and Sarah, a deeply moral opera about the importance of authenticity and courage. Though composed nearly twenty years ago, this thesis is even more pertinent today, as we learn to negotiate the hostile xenophobia of our own age. For all our sakes, we cannot let this knowledge be subjugated. We must be ourselves, no matter the price. And it is with this conviction, as well as the artistic merits of the piece, that I recommend Patience and Sarah.